‘Interior design isn’t really about which wallpaper you use or what the finishes are,’ Gwenael Nicolas told the Business of Fashion in a 2014 interview. ‘What it is, above all, is a choreography. It’s about how people move in a space, what they do.’ His Tokyo-based practice Curiosity covers the design gamut from products and furniture through to graphics and architecture, but he has become particularly known for creating retail spaces for top luxury brands: Fendi, Louis Vuitton, Dolce & Gabana and now Versace. Versace’s new concept store is in Miami’s luxury shopping destination at Bal Harbour. The Nicolas hallmarks are all there: the powerful use of light (and shadow), simple but striking geometry and the sense of a journey. ‘The store is a journey to discover or rediscover the icons of the brand from a different perspective, which surprises the visitor through new and dynamic elements,’ says Nicolas. The black-and-white patterned facade is designed to catch the eye and is a cool contrast to the warmth of the predominantly gold and white – with more than a touch of Versace bling – interior. The series of spotlights housed in the ceiling grid structure allows light to play both on its gold finish and highly reflective vertical surfaces. As it falls on the white walls, especially in the shoe salon at the far end of the space, it suggests sunlight through trees. ‘The ceiling, a delicate golden structure, runs through the space: the light shines from and with it and creates a visual effect,’ says Nicolas. The store is designed to flow, guiding the visitor through the typically asymmetric, lozenge-shaped interior. The shoe salon is demarcated by a series of highly reflective vertical bronze elements, taking the customer into a contrasting cooler, blue space. ‘The different material of the space fuses together through a controlled shadow projected on the walls,’ says Nicolas. Photographed as an empty space, it is difficult to judge how the often vibrantly coloured Versace fashion items will play against the backcloth. But the product is always Nicolas’s key concern even in a such an opulent environment. He describes his approach as ‘textured minimalism’. 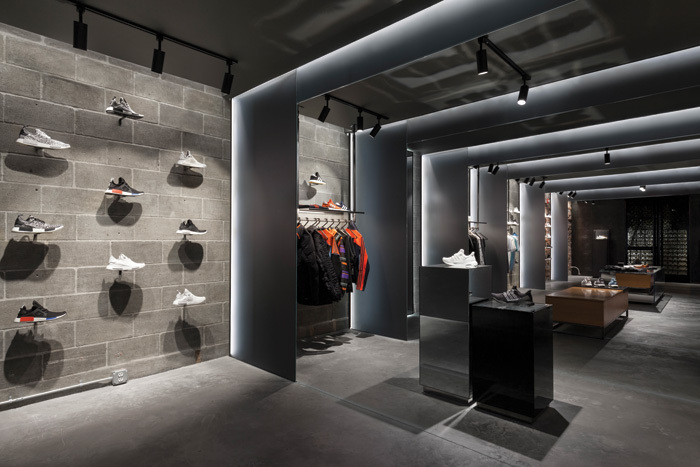 The winner of this year’s FX Awards’ retail category, The Sanctuary in Boston, Massachusetts, is the third collaboration between Adidas and streetwear brand Concepts, known for its collaborations with brands such as Nike, Dr. Martens and Birkenstock. As with a conventional place of worship, this temple to consumerism is designed to create a sense of discovery and inspiration, using a series of modular thresholds in what is essentially one long, corridor-like space. ‘Fans descend through the liberation tunnel chamber, walk and pause through a field of discoveries, and in temple-like fashion, finally arrive at the space of celebration,’ says Leblanc. The journey begins with patterned metal doors, specially designed by Sid Lee to suggest the interlocking of the Adidas and Concepts brands. Minimal design, monochromatic tones and raw materials are used to throw all the emphasis on the merchandise. The products are displayed and supported by discreet metal fasteners allowing the sharply highlighted shoes to apparently float on the brick and concrete walls. Light, reflective surfaces and sheet-glass arches create pockets of discovery, while glass and mirror sculptures present the merchandise from unusual angles playing with traditional perceptions. These include special interactive mirror boxes designed by artist Jordan Soderberg Mills, who has exhibited at the V&A and London Design Festival among others, but never before in a retail space. An interactive, projection mapping display helps tell the story of featured products, from new releases to ‘archival’ footwear including collaborations with designers such as Raf Simons, Rick Owens, Stella McCartney and Kolor.